The Nomad is an all-round single person kayak ready to play in the surf, drift along slow-moving streams and rivers or even for anchoring down in your favourite fishing spot while you cast a line. It combines a large ergonomic cockpit, comfort seating system and proven hull design to create an experience on the water that any paddler will enjoy. One of the most popular 3m sit on tops for all round paddling on the sea and inland waters. Perfect for family fun, a spot of fishing and for light touring. 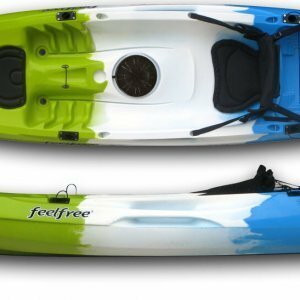 The Feelfree Nomad is a great solo kayak suitable for the whole family to paddle. Nomad was carefully designed to be stable, straight tracking yet still manoeuvrable for use off the beach and amongst the rocks. Perfect for endless days of fun on lakes, canals, gently moving rivers, sheltered coastal areas and in small surf. Nomad paddlers can also use the boat as a fishing platform to fish areas that just aren’t accessible from the bank or shore. Manufactured to a high standard the kayak is robust, durable and will last for many years. The Nomad has lots of well-designed features, bow and stern handles, side carry handles, cargo well, centre hatch, drain plug, areas to fit fishing rod holders and a wheel in the keel. Its hull shape means Nomad paddles really nicely. It will track well but is still short enough to manoeuvre around rocky bays and coastline. The seating position and leg length are designed to enable both adults and youngsters to paddle with ease. Canvas seat, Deluxe Seat, Paddle Leash, Scupper bungs, Tracking Skeg and Thigh braces.